What happens when you mix clever but simple ‘sound byte’ cartoons with somewhat complicated political issues? Sometimes you get bad analogies. And these bad analogies often just serve to confuse and misinform viewers. 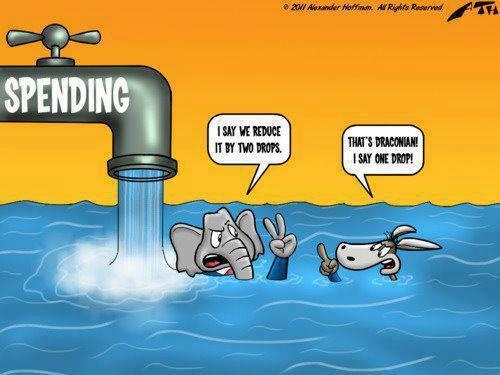 In the cartoon below, the elephant (Republican) and donkey (Democrat) argue over whether to reduce he leakage by one or two drops, and it makes them both appear out of touch. If this analogy were based on reality, it would include the fact that there exists a drain that can lower the water, not just the option to turn off or lower the water faucet. In other words, cutting spending isn’t the only option. 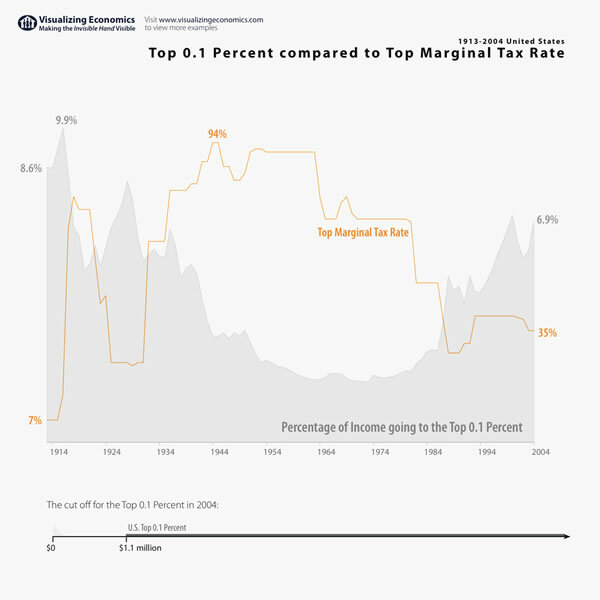 There is the potential to raise tax revenue (for example, by rolling back the Bush tax cuts, and certainly by NOT passing further tax cuts Republicans would like to enact). And it’s the elephant that wants clog the drain even more (cut tax revenue) while the donkey wants to open it a bit. But of course, the caricature isn’t intended to actually inform us. It is entertainment. 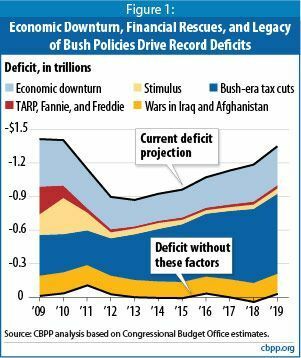 Less entertaining and less appealing to our limbic system (but more informative), here is the breakdown of what’s causing our current and projected future debt. 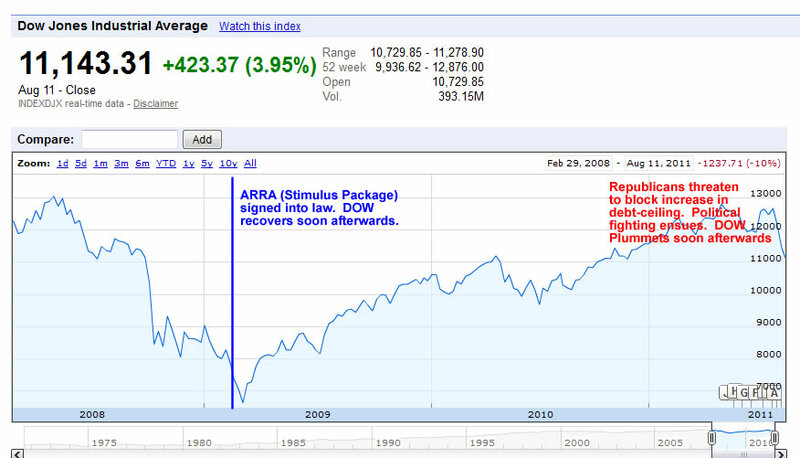 In fact, the era of deficit spending began under Reagan as he reduced taxes on the wealthiest Americans. 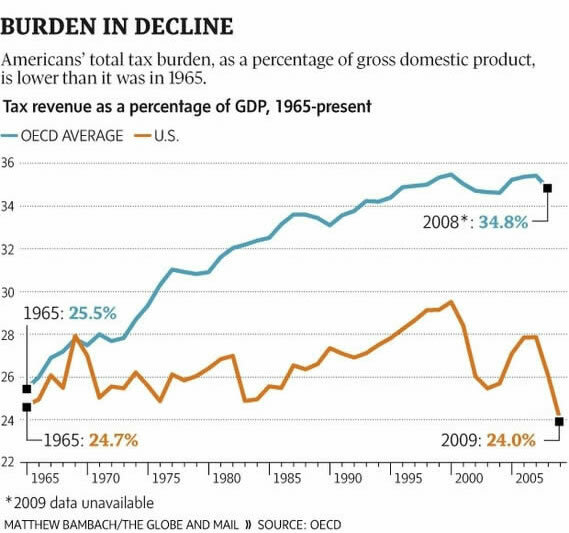 One little known fact is that tax burden as a percentage of GDP has largely fallen for the US overall, especially compared to the OECD average. Unfortunately, middle and lower class wages have fallen as more wealth has coagulated at the top. So to many Americans taxes seem high because their incomes haven’t risen the way it has for those at the top.